I was eleven years old in 1951, and in fifth grade at the Raymond Avenue Grade School in Poughkeepsie, New York. Although we were not supposed to leave school grounds during recess, some brave soul discovered 1951 Bowman baseball cards at Reed’s Variety Store, across the street from the school. I guess I was a little slower than some of the other kids, because I didn’t get started collecting until the second or third series was being sold. I quickly became fascinated by the 2 1/16” by 3 1/8” colorful pieces of cardboard that pictured most of the players in the 16 Major League teams of the day. It wasn’t easy going back and getting all the cards that I’d missed, but by making trades, and even buying cards from kids, I was able to get the cards I missed, and eventually collect the whole set. I still remember the terrible time I had talking one of my friends out of the Ed “Whitey” Ford and Larry “Yogi” Berra cards, numbers 1 and 2. I collected cards through 1956; then, like most other teen-aged boys, became more interested in girls, cars, and other more “grown up” activities. Fast-forward twenty-nine years. After several years of almost getting back to collecting, I finally took the plunge. My kids were old enough to get interested, so I started buying 1980 Topps wax packs and had a great time completing the set with their help. But what I really wanted to do was reconstruct a 1951 Bowman set, since like everyone else, all the cards I collected as a kid had mysteriously disappeared while I was away at college. 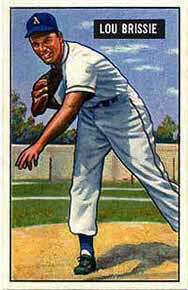 I bought my first 1951 Bowman, Sam Dente, number 133, from Bob Berry, in December of 1981. I was hooked. I bought the whole 5th series from an ad in SCD in the spring of 1982, and while on vacation at Ocean City, New Jersey, in June, I bought 138 different low number commons. I could have had the Mantle for about the same price, but went for quantity instead of quality. I’ve had mixed emotions about that decision for a long time. At this point, I decided I needed a want list for the remaining cards in the set. This was before the advent of organized price guides. While creating the want list, I discovered that there was a definite pattern to the set. I knew that the cards were released in 7 series of either 36 or 72 subjects, and that the whole set consisted of 324 cards. I noticed that the cards were arranged in order by team, in a repeatable sequence. The teams alternated by league: Yankees, Phillies, Indians, Dodgers, Athletics, Cardinals, White Sox, Giants, Red Sox, Pirates, Senators, Braves, Browns, Cubs, Tigers, and Reds. The Yankees and Phillies were first, because they played in the 1950 World Series. This sequence of 16 teams was repeated ten times from card number 1 to card number 324. Series 3, 5, and 6 had one 16 team sequence; series 4 and 7 had two sequences. Series 1 and 2 had three sequences between them: cards 1 through 24, 25 through 48, and 49 through 72. Teams were represented by either, one, two, or three cards in a row, with the Yankees always leading off and the Reds in last place. It was then I became as interested in what it said on the card backs as I was in the pictures on the card fronts. Some players were pictured in the uniform of one team, and listed on the back as playing for a different team. Since I wanted the correct team for each player to appear on my want list, I needed to find out what was going on here. 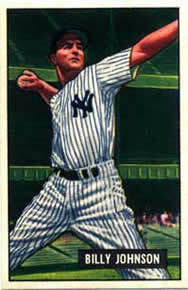 For example, card number 155, Lou Brissie, is shown in an Athletics uniform, but on the back of his card he is listed as a member of the Indians. The following table looks at three cards from the 4th series. It looked like some players were traded during the season and the text on the card back was updated while the drawing on the card front remained as it was before the trade. It even appeared that Lou Brissie and Sam Zoldak may have been involved in the same trade. As I acquired more and more cards, and studied them in earnest, it became clear that in several instances, the set pattern that I talked about before, was disrupted by players switching teams. If you look at the next table, and you distinguish between card front teams and back teams, you can see more clearly some of the updates that went on during the production and printing of the set. The table shows the relationship among these same three traded players from the 4th series, with their original and revised placement in team sequences. As you can see, the Brissie card was supposed to fit in with the A’s grouping after number 154, Suder. The same kind of thing happened with the other two cards mentioned above: Zoldak and Rojek. While none of this is exactly rocket science, I was having a ball constructing all kinds of lists and even field position diagrams by team. It was during this time that the phrase, “traded at press time” on a few of the cards, began to sink in. Card backs were modified “at press time”. Here’s a set of cards that actually was modified during production to keep traded player’s teams current! These days when sets come out in November of the previous year, not even the so called “traded” or “update” sets do near as good a job of keeping track of player movement. I began to notice other things on card backs that were interesting. 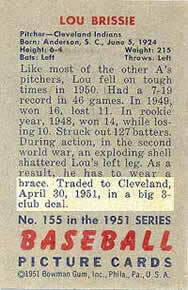 There were actual events from the 1951 season that were mentioned on the card backs. The next table shows what I mean. As would be expected, most of these events where described on 7th series cards. It was at this point, that I decided to do something that would occupy my spare time for the next several years. The Stirnweiss card, number 21, triggered it. 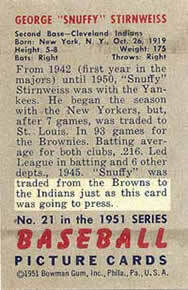 He’s pictured as a member of the St. Louis Browns, but the back of the card says he was traded to the Indians “as this card was going to press”. I found out the trade date was April 1, 1951. That meant that the first series of cards was probably produced sometime in April. From this revelation, I decided to try and figure out when each of the seven series of 1951 Bowman baseball cards was printed, based solely on what was mentioned on the back of the cards. The results of my efforts may be close to reality, or completely off-the-wall. I had no help from any other collector, nor did I do any research into the workings of Bowman Gum, Inc., or interview George Moll, before he died. This was a pure and simple exercise in logic, based on what was written, or just as importantly, not written, on each of the 324 cards in the set. By this last, I mean if some relatively important event that happened during the 1951 season is not referred to on the card I assumed the card was produced before the event actually took place. This may not be empirical data, but it sufficed for my exercise. 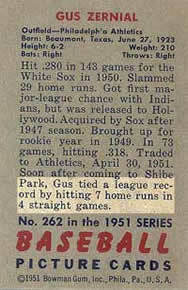 An example of this would be the big trade between the Dodgers and the Cubs on June 15, 1951. None of the players involved have any mention of the trade on their cards. My first order of business was to find out what was written on the backs of all 324 cards. I probably had 300 different cards by this point; the cards I didn’t have were all high numbers, including the Mantle and Mays cards, which to this day I do not have (This was before the 1951 Bowman reprint set or the internet). I corresponded with dealers and had them copy down exactly what it said on the backs of cards and mail the information to me; I copied card backs at shows I attended. I then began to place the cards into different categories based on the kind of information they contained. 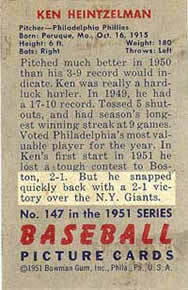 I separated players, who had been traded during the 1951 season, and it was noted on the card, from players who had been traded and no mention of the trade was made. Likewise, those who were sent to the minors during 1951 - mentioned and not mentioned. I spent months looking at microfilm of the sports pages of the “New York Times”, in my local library, and noted all the 1951 player and manager movement I could find. I spent one entire day in June, 1992, sitting in the National Baseball Hall of Fame Library, at Cooperstown, reading 1951 issues of “The Sporting News” and the “National Association Bulletins” for 1951. I got a copy of Joe Reichler’s “The Baseball Trade Register”, and made sure I knew the details of every trade that occurred in 1951. I even corresponded with players to find out things like when Del Crandall was inducted into the armed services and what exactly happened to Hank Wyse when he “switched” to the Washington Senators. It then became possible to order a subset of each of the seven series of cards, by date. I could determine which cards were printed before a given range of dates, and which were produced after the same range. This technique is shown in the next table. Bold printed items are quoted directly from the card backs. “To the Indians as this card was going to press”. “Traded to the St. Louis Cardinals at press time”. “Released May 16, 1951, signed by the Yankees May 28”. Well, there you have it! Is it accurate? I don’t know. Is it pretty close? Probably. The only information I have to dispute my calculations comes from a correspondent of mine who thinks he remembers the 5th series coming out when he was at Boy Scout Camp in late July. I have almost 200 pages of research on the 1951 Bowman baseball card set and the 1951 baseball season: lists, team field diagrams, rosters, letters, pictures, autographs, etc. I have a searchable database containing all 554  players in the majors during 1951, with most of their important batting, pitching, and fielding statistics. I developed a set of templates for all 324 1951 Bowman cards, containing summaries of the information I found by reading the card backs, as well as player career highlights and lowlights. 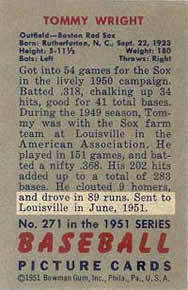 I have team lists showing which players appeared in the 1950, ‘51, and ‘52 Bowman sets and the 1952 Topps set. I would be extremely interested in corresponding with any readers who share my fascination with the 1951 Bowman baseball card set, and its players. 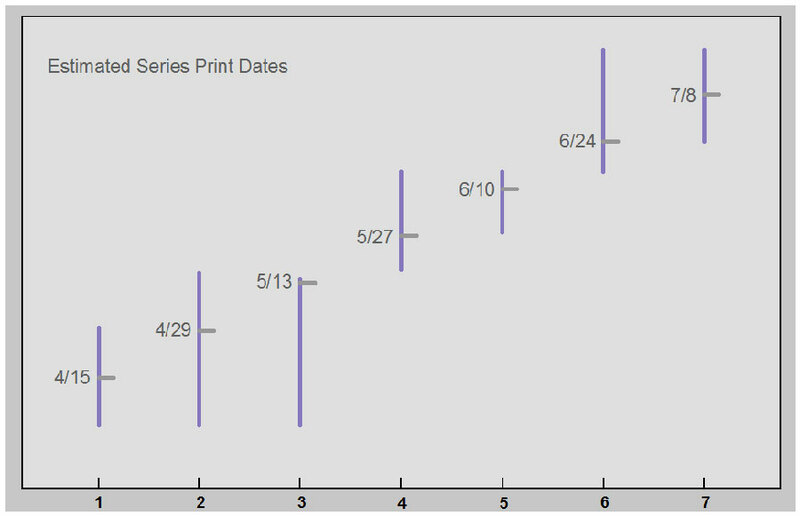 If any reader actually knows the true printing dates for any, or all series of 1951 Bowmans, please send me an e-mail to the Webmaster, below. 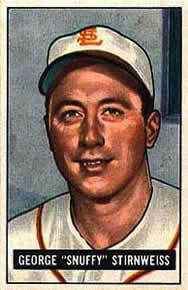 Clint Cramer's fine 1951 Bowman Web site can be accessed from this link. 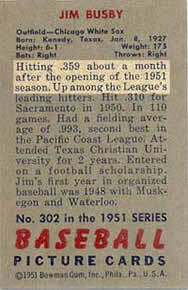 1952 Topps card number 31 commemorates the same event one game earlier. Gus hit 6 homers in three straight games - thus the six balls attached to his bat. 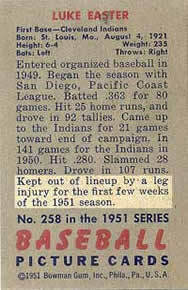 According to the 1952 issue of The Sporting News "Baseball Register", there were 277 players in each league in 1951.